To help understand the complicated universe we live in, we have compartmentalized physics phenomena into distinct disciplinary specializations. However, natural and engineering problems often cross these utilitarian borders. A major strength of the COMSOL Multiphysics® software is the ease with which such cross-disciplinary interactions, which we refer to as multiphysics interactions, can be accounted for. The COMSOL® software provides a plethora of built-in multiphysics couplings and even enables users to implement their own physics couplings. Each approach is advantageous for different modeling scenarios and varies in terms of ease of implementation and amount of effort required from the user. The manual approach involves selecting the individual physics interface and then adding the multiphysics couplings. This is typically done in a sequential order and by conducting multiple standalone analyses to incrementally build up to the multiphysics problem. The user-defined couplings involve including user-defined expressions, equations, or functions to combine the physics in your model when there are no predefined multiphysics couplings available. In this post, we will focus on the fully automatic approach and address the two others in subsequent blog posts. The fully automatic approach is a highly recommended way to add physics for a multiphysics model. 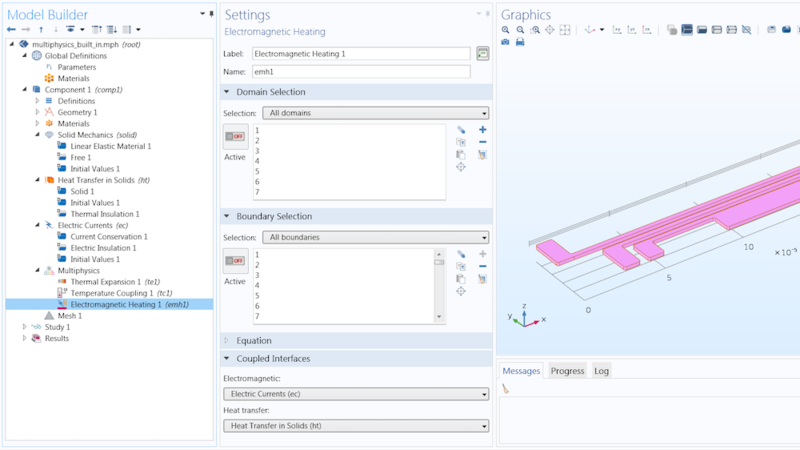 By automatic, we mean to use the predefined multiphysics interfaces that are built in and readily available in COMSOL Multiphysics, as well as automatically preconfigured for the multiphysics interaction being simulated. These interfaces are available for several disciplines of engineering and type of application area, including electromagnetics, structural mechanics, acoustics, fluid flow, heat transfer, and chemical engineering. Multiphysics interfaces make the modeling process simple. Their use automatically adds all of the necessary physics and couplings to your model at once. Additionally, they automatically include the optimal element discretization settings for the combination of physics in a model. In these ways and more, the automatic approach lets you more quickly dive into defining the physics for a multiphysics model without having to get bogged down with the small details or do all of the work from scratch. 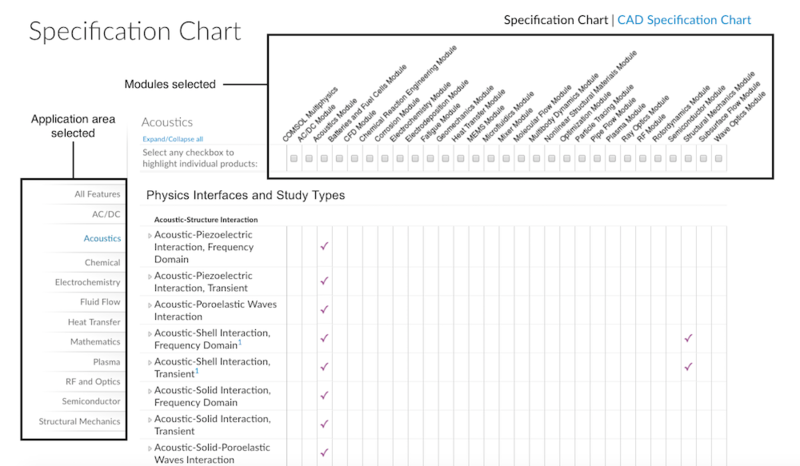 For a complete list of the multiphysics interfaces available to you for any COMSOL products you hold a license for, you can view the Specification Chart. There are a number of ways you can browse the chart, as noted in a previous blog post. 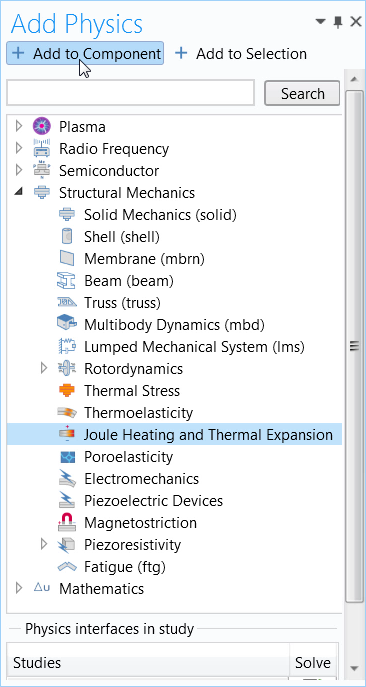 Simply select the application area your module(s) fall under or the modules themselves (or both) and scroll down to the Predefined Multiphysics Interfaces section to see the list of built-in interfaces. The Specification Chart with the Acoustics application area selected. Below, we highlight one example of the numerous multiphysics interfaces included in the software, as well as what it can be used for. 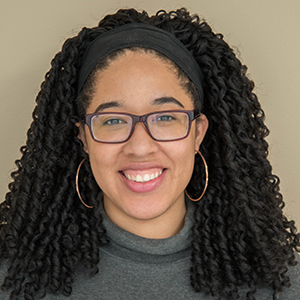 Perhaps you work in the plasma sciences and need to build a multiphysics model observing several effects, such as in plasma arc welding applications. Modeling this complex process requires including and coupling electricity, magnetism, heat transfer, and fluid flow. 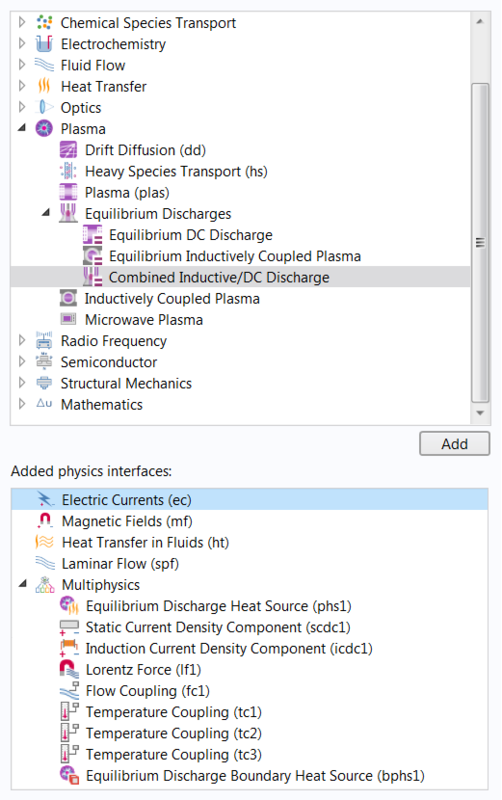 In COMSOL Multiphysics, you can use the Combined Inductive/DC Discharge multiphysics interface to automate the entire physics setup, thus enabling you to define the multiphysics phenomena present in plasmas in a significantly easier way. The Combined Inductive/DC Discharge multiphysics interface selected and added under the Plasma branch of the Physics Wizard, with the branch containing the multiphysics couplings expanded. Let’s use the thermal-electrical-mechanical (“tem”) version of the thermal microactuator tutorial model found in the Application Gallery on the COMSOL website, to demonstrate the automatic approach for adding the physics for a multiphysics model. Note: For the sake of brevity, assume that all steps in the modeling workflow, apart from defining the physics, are complete. Thus, the geometry, materials, mesh, and study are already set up. Additionally, we will narrow our focus to defining the multiphysics aspects of the model and not go into detail regarding how to add and define specific boundary conditions for the constituent physics interfaces. First, we define the physics for Joule heating and thermal expansion. A voltage is supplied to the bottom of the anchor on the middle arm. The conducted current is resisted as it flows through the actuator, resulting in electric heating, which raises the temperature of the device and causes it to deform. The base of all of the anchors are fixed, but the dimples enable the arms to translate in the xy-plane. The thermal microactuator geometry with the parts labeled. The device is made of polysilicon. The Joule Heating and Thermal Expansion multiphysics interface being added to a model component. Upon adding Joule heating and thermal expansion to a model, notice that several physics nodes have also been added to the model tree. These include the Electric Currents interface; Heat Transfer in Solids interface; Solid Mechanics interface; and a multiphysics node containing the couplings for electromagnetic heating, the temperature field, and thermal expansion. A screenshot of the physics setup that is automatically added when using the automatic approach. The electromagnetic heating multiphysics coupling passes the resistive heating induced from the electrical problem (the current conducted through the actuator) to the heat transfer problem. The temperature multiphysics coupling passes the temperature field from the thermal problem (the heating of the actuator) to the structural problem. Depending on the materials assigned to the geometry, it also passes the temperature back to the electrical problem so as to modify any material properties that are temperature dependent, such as the electrical conductivity. Lastly, the thermal expansion multiphysics coupling combines the thermal problem with the structural problem (the structural stresses and strains induced due to thermal changes) by including the temperature field as a thermal load. This is why we always recommend using the automatic approach whenever possible. By adding the multiphysics effect you want to analyze, it instantly adds all of the appropriate individual physics interfaces, automatically couples them, and includes the modified settings that are optimal for computing the combination of physics included in your simulation. You don’t have to worry about recalling if you’ve included the correct multiphysics nodes or applied the appropriate settings from one physics interface to another, since it is all automated. From this point forward, we can focus on defining the physics for each individual physics interface, such as adding any necessary boundary conditions or constraints and editing the settings. 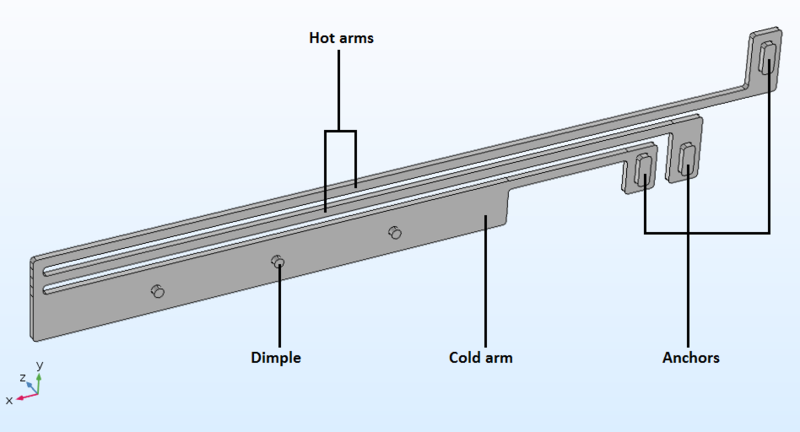 To see how to build the complete model using this approach, see the thermal microactuator tutorial model in the Application Gallery. Take advantage of the multiphysics interfaces and options available for different physics disciplines that are available in the COMSOL® software, which, in tandem with the multiple setting modifications performed automatically, provide several distinct benefits. Watch the related tutorial video to see a demonstration of the fully automatic approach. The video uses the Bracket – Thermal Analysis tutorial model as an example, so between this blog post and the video, you get to see two different multiphysics examples!